How do we build brand awareness? The answer most entrepreneurs would give is visibility and showing up in their industry, but just being visible isn’t enough. You can pour hours into constructing the perfect Instagram feed, taking beautiful pictures and plastering your logo onto carefully designed graphics, but still not be successful at making your audience aware of your brand. Sure, they’ll see your pretty pictures, but they won’t know the value you bring. So maybe your plan of attack is well written copy. You study the art of persuasion and meticulously select your words to try to build credibility for your business, but guess what? Many people won’t make it past the first few paragraphs because either you couldn’t interest them from the beginning or they simply hate to read. But maybe your pictures are awesome and you paid for a powerful copywriter to do the work for you… is that really enough to make your audience want to interact with you? Want to know a SMARTER way to build your like/know/trust factor and win over your market? Speaking is verbal copy, and it amplifies the effects that written copy and visuals provide. It build rapport with your audience and helps them to develop a relationship with you, even if it’s one sided. When you speak, listeners don’t just learn about your expertise, they get to know WHO you are, and who you are can be the deciding factor on whether someone will buy from you or not. It can be used to advertise and promote your offerings at no cost, and calls your audience to action (like, share, subscribe, buy). A huge plus is that it’s easily digested. People may not like to read, but they won’t mind watching a 3 minute video! You’re also in complete control of the narrative, so you don’t have to worry about misrepresentation. Typos and autocorrect go out the window, and you can quickly change direction as your audience interacts with you either in person or over a live stream video. If you’re looking for a simple, yet effective strategy to build brand awareness, then it’s time to build your speakers platform. 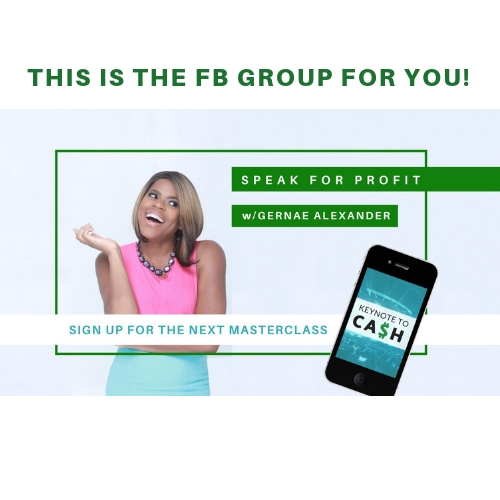 Also feel free to join me in my Facebook group Speak For Profit With Gernae Alexander, a group designed to support you on your journey as you build a profitable speaking platform selling your services and products. Have courage and build awareness around your brand with speaking!